I have been working hard over the last month to bring together an idea I have had for some time, Indian Summer. I want to showcase and highlight how my food and ideas about food are changing and evolving as I carry on my adventure. Having completed a season of sell out supper clubs I wanted to return with something that was exciting for diners and for myself! The aim of Indian Summer is to keep that feel good summer vibe going well into autumn (well one can only hope!) and I will be trying to achieve just that at the supper clubs. 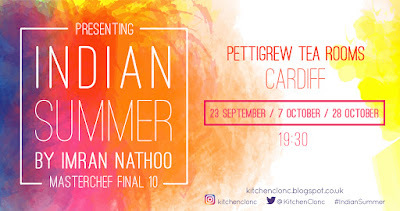 Indian Summer supper club will be held in the stunning and handsome West Lodge building in Bute Park, home to the equally magnificent Pettigrew Tea Rooms. The setting and venue only just surpassed by the amazing team there that support me during the supper clubs. I am over the moon to be returning to Pettigrew Tea Rooms to what is quickly beginning to feel like home. 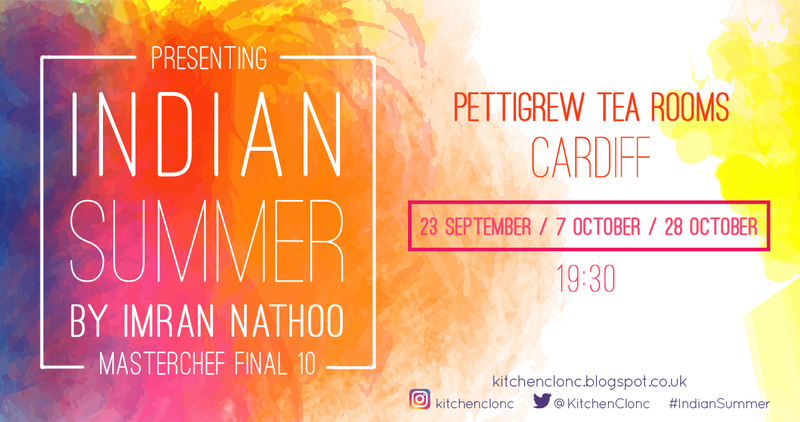 But the supper clubs are just one part of Indian Summer with a couple of surprises and special announcements to be made over the next couple of months! Fantastic food in an informal environment is my idea of a great night out and I hope to deliver just that for you! The menu is set and there are no alternative menu options, I can cater for some dietary requirements but not all - please contact if you have any questions on this.